Chinese new year 2012 draws near. I'll see if I can make a quick dragon painting before January 23. For now, I'll just make a post about the first fantasy painting I did since the beginning of 2012. My dear friends, I present to you my latest work: Kampilan ni Makabo. Makabo is a certain badass tikbalang warrior who happens to be my favorite character from the graphic novel Skyworld, created by Ian Sta. Maria and Mervin Ignacio. Right now they have this Pin up shout out thing going on. This is the colored version of my entry. Now about the process, I know I need to find a better way of documenting my paintings. Unfortunately I'm not sure if this aging rig of mine can handle any sort of video recording while I'm painting medium to large-sized images. The full-scaled version of this one which measures 3600 by 5400 pixels at 300ppi. Until my next upgrade, I'll have to stick to progress shots like these. The procedures I employed during the production of this particular artwork isn't very different from the ones I've used in my earlier works. I started by gathering inspiration from some of Frank Frazetta's paintings. Then I fleshed out my own idea by making a tonal thumbnail that basically has all the silhouettes of the major elements in the painting. I had a hard time deciding which pose I'll use for the subject. It's been more than a decade since I drew a Tikbalang. I settled for something that makes the subject here look triumphant or proud. I love reddish hues. Grey scale just feels quite uninspiring to me so I usually make tonal thumbnails using a warm palette. It's just a matter of preference and it's not always the best approach but it works for me most of the time. After establishing my composition, that's when I made a color thumbnail which made the rest of the production process easier. The more I follow this order of procedures, the more I realize the value of making quick studies prior to painting full blast. My observation is that solidifying your composition early on significantly reduces the possibility of getting stuck in detailing the less interesting parts of the painting. Here, I made sure the most noticeable lines lead to the subject. Using light and color, I put greater emphasis on the muscles on Makabo's chest and upper extremities to make him look as powerful as possible even though he's only standing and holding a kampilan. For the backgrounds, I just played around with texture brushes to give the impression of rocks. As you can see if you'd look closely at the figure, not all parts are fully-detailed. Some parts fade into the shadows. This is a technique called vignetting which is very helpful in accentuating the focus of the painting. I tried not to stray too far from how Makabo looked as drawn by Ian. This is fan art after all so I didn't concentrate on making tattoo variations. I did, however add a few trinkets I imagined on my own. Also, the kampilan he holds is of my own design. 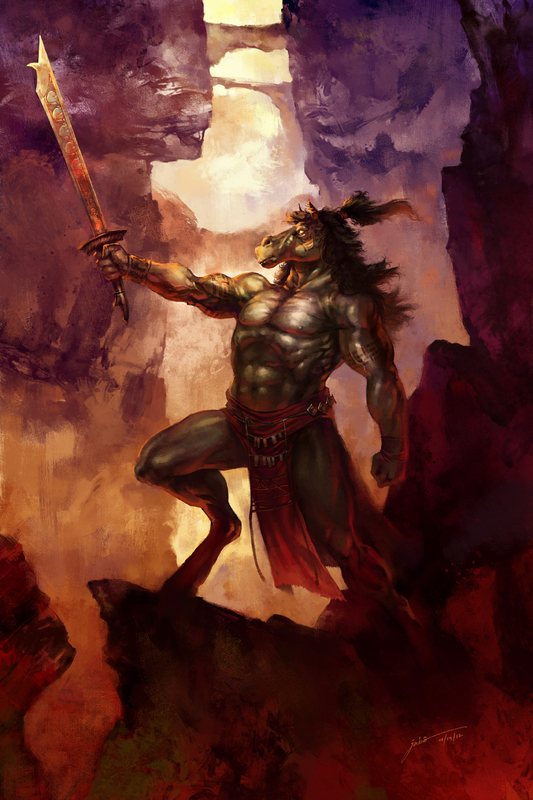 Tikbalang - a supernatural creature from Philippine folklore commonly depicted as having the head of a horse and the body of a man. Kampilan - a popular single-edged sword widely-used in the precolonial Philippine Archipelago. If you look closely at the kampilan Makabo wields in this image, you'd notice that it's decorated with okir-based patterns and three alibata characters namely, "ma", "ka", and "bo". update 01/23/2012: I did some corrections to the finished painting and I posted more notes about it here. ang ganda ng painting! salamat. ang comment ko lang ay baliktad ang pagkahawak ng kampilan - nakaharap ang humahawak sa talim. ang tamang hawak ay kagaya dito: goo.gl/6B4sy. salamat muli, at sana ay dumami pa ang mga painting mo tungkol sa mga mito at leyenda ng kapuluan.